I've been very lucky that S gets five WEEKS (five weeks! y'all!) of paternity leave, so he is at home with Ellie while I go back to work for now. It's made the transition so much smoother, and I love that he is really getting to know her well! Life is a little too busy for my tastes right now, but full of good things. I'm pondering what plans I want to make for the future, and what commitments I want to let go of for now. Is anyone else terribly bad at saying "no" or even "not now" to things? How do YOU balance those decisions in life? 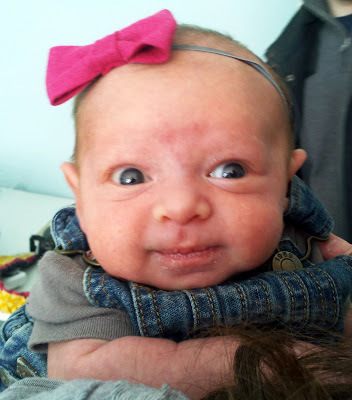 I'm guest blogging today over at Mama Loves Papa, and the topic is new motherhood. I read an article once that sums up how I feel about being a new mother. I was a great mother, it said. And then I had a baby. I think this is a first for me--sharing a recipe on here! Which is funny, because I cook a whole lot. One of the side effects of being a religious Jew is that there is a lot of eating involved, especially for Shabbos, and hence a lot of cooking. I have a dessert bias, so if you check out my recipe binder, it's about half desserts and half everything else:) And subdivided into cookies, cakes, bars, pies, breads, and more. I'm a dessert fiend. Last week I tried out these chocolate hazelnut cookies. The recipe seemed a bit patchke (awesome Yiddish word meaning "way too complicated and who has the time, anyway?") so I simplified it. First you whip up some chocolate hazelnut cookies. I mostly followed the recipe, but just used plain chopped hazelnuts from the bag--I'm all about cutting corners in the kitchen! You spread frosting between two cookies, and voila! A batch of delicious chocolate hazelnut sandwich cookies. I love these because they look complicated and fancy, but they're so quick and easy! And they tasted amazing. Does anyone else photograph their food a lot? I usually feel too awkward to do it in public, but I just had a little photo shoot with my Dunkin Donuts coffee in the privacy of my own home:) While I love photographing Ellie the most, the coffee can be a more cooperative subject! So make me feel better here--do YOU photograph food, also? At home or out and about--or both?? Hello friends! Now I realize it's already March 20, but I still have my Write. Click. Scrapbook. March project to show you. The theme this month is mini albums, so I created one documenting my baby girl's first week. I was a bit late for the online WCS gallery so I wanted to share it with you guys here! For my first page, I documented Elie's bday with this adorable calendar tag from Elle's Studio. I made a page or two for each day of her birth--some of them more simple and spare, and some of them more wordy. I primarily used a kit from Baers Garten Designs on Etsy. It was little girl themed and worked perfectly! I added in items from a Studio Calico add-on and my own stash. These Chronicle Books envelopes were a fun addition! I also used butterflies liberally--gotta love 'em butterflies. I used day of the week cards and badges from the same etsy shop to divide up the days. I added a house icon to mark E's first time at home (which consisted of her screaming from 9:00 pm until 3:00 am, until S finally slept on the floor next to her bassinet. I woke up delirious at 6 in the morning to find them both missing--crazy times!). And there you have it! The album still needs to be manually assembled, but it's basically done, right? Are YOU a mini album person? If you had to make one today, what would it be about? Life is full of transitions, especially right now. This week, I went back to work--my first time leaving Ellie for more than 3 hours in a row. It was hard. Not always in the ways I expected; it would hit me when I walked in the door, late at night, and in the middle of the night (something about 3 am that lends itself to existential crises). I'm so fortunate that my work has been understanding of my role as a new mom and let me cut back my hours, and that makes this much easier. But still, it's a new chapter. It's funny to think about how much has changed in six short weeks. I feel much more confident as a mommy (at least most of the time). I can see that this gig is way harder, but also way better, than I had thought. And to add in one more transition, I have a scrapbook page to share with my Scarlet Lime kit from this month! I'm in love with all of the new Dear Lizzy goodies--and, as always, accordion flowers. And teeny little ladybug feet. I adore that striped ribbon from Pink Paislee's Nantucket line! What's been YOUR biggest transition lately? My mommy wants to blog right now, she really does. Only problem is that I need her to take care of a few things for me. So hang in there and I'll allow her to write again in the next day or two! Tonight (well, right about now actually) begins the Jewish holiday of Purim. I've always been a BIG fan of Purim. Take candy + costumes + a good story + great food + jam-filled cookies + lots of rocking parties and you have a great holiday, in my opinion. If you ask my friends, they'll attest to the fact that I like to go all out for my costumes whenever possible. One year (in high school no less) I showed up as a cluster of grapes. Annoying to get around, but entertaining. This year's costume is a bit more slapped together--life's been a tad hectic to say the least. But I can't wait to show it off to y'all very soon! As much as we're smiling in this photo, when I think of last year's Purim, I can't help but remember how hard it was. We had just had some big disappointments in our infertility journey, and being surrounded by families on such a kid holiday was difficult. I remember praying so hard that this year would be different. And this year? I can barely find time to hear the megillah because I'm busy nursing and cuddling my little girl. I wouldn't even attempt my cake balls of last year--I'm not crazy! My life is still stressful and hard sometimes, but that empty hole that was prominent last year is gone. I'm grateful. One of the themes of Purim is hiddeness. G-d's name does not appear at all in the megillah (which, btw, is a scroll telling the story of Esther--find out more here) just like G-d's actions and purposes are hidden in the world. Last year, I didn't know how my story would play out, but He did. And just like in the Purim story, all will work for the best, even if I can't see it at the time. Wishing you a happy, happy Purim if you celebrate it. And a happy, happy Thursday if you don't. Make it a good one! It's official, folks--Ellie is now one month old! Or at least, she was a few days ago, but we're running on Jewish time + mommy time here, so you'll have to forgive me:) Ellie was born on February 1, so that makes remembering her month-aversaries that much easier! Still hating on bathtime. She looks almost insulted when I squeak the rubber ducky at her to keep her happy! I'm still working on my photo shoot technique (AHEM--see photo below), but so far I'm using belly stickers from BuddhaBellies on Etsy, my chalkboard photo prop, and matching accessories. And do you see that adorable quilt? That was handmade just for little e by the super sweet (and so talented!) Holly Humbert! It makes me want to take up quilting, although truthfully, I don't think I could make something more "me" than this gorgeous blanket. I'll be back soon with my Write. Click. Scrapbook. project for March! And tell me, what are YOU looking forward to in March? Before I go, looking for some help on learning how to run actions on PSE 9. Can anyone recommend a good tutorial? As I was printing my Project Life photos for last week, I figured I'd share them with y'all! This week has been full of crying, crying and more crying (mommy and baby both) so I'll spare you the details and focus on LAST week. Ha! My mom and siblings were visiting last weekend, so we spent Sunday with my grandparents. Little E was dressed up for the occasion, naturally. While my family watched the baby, S and I went to our favorite restaurant for lunch and ordered our classics--portobello cream cheese sushi (I came up with it to replace fish when I was pregnant, and it's AWESOME) and ravioli funghi and salad. Mmmmm. I've been finally organizing Ellie's closet and I'm loving all of the PINK! Little ladybug feet. . . . . This was a new mommy "first" for me. Our synagogue coordinates two weeks of meals for all new moms, so this was my first Shabbos making my own food. I was a bit nervous, but E cooperated very nicely. She must have learned in the womb that Fridays are crazy enough without lots of crying. I tortured my little one a bit by dressing her in a frou-frou headwrap. I love the crazy face she's making here. Totally that "Mom what are you DOING?" look. Ha! And last but not least, another photo of my mush:) We took her out to lunch at a friend's on Saturday and she looked SO cute, but alas, we don't take photos on the Sabbath. I just might dress her in it for a photo shoot one of these days.